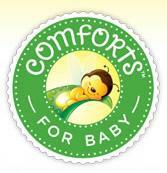 Click here to visit the Comforts for baby facebook and like them. Then on the “Sample Conforts” tab, fill out the form to request your free samples. Allow 6-8 weeks for delivery. According to their facebook, this is not available in the following states: ME, VT, NH, MA, NY, NJ, CT, RI, DE, PA, MD, FL, MO, ND, SD, WI, IA and HI. Image Credit: Comforts For Baby ; thanks Tabatha! when you click on Terms and Conditions in the actual form itself, it says page not found? Not avail. in OHIO either!!!! i would like one for my granddaugther.